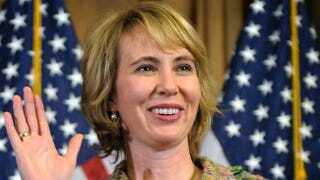 Should Gabrielle Giffords resign Her office? Hip-hop Republican John S. Wilson is arguing that Rep. Gabrielle Giffords should resign her office so that her constituents will have proper representation. He suggests that among all of the questions being asked about gun control, heated political rhetoric and the impact of her shooting on the 2012 presidential election, people should also be asking who will represent Arizona in Giffords' stead. Although Arizona law does provide a remedy — stating that if an official officeholder is unable to "discharge the duties of office for the period of three consecutive months, the office shall be deemed vacant and at such time, a special election could be called to fill the opening" — Wilson argues that this law would not apply because of the circumstances under which the office became vacant. There is also not a federal law in place to remedy the situation. Wilson believes that Giffords should resign and let someone else have a shot at representing the interests of her constituents. We say, let her heal first, figure out her prognosis going forward and then decide whether she wants to continue as an elected official. The assumption that her injuries will affect her ability to serve is exactly that — an assumption until further notice. Wilson raises a logical point, but empathy has to be somewhere in the mix. We're certain that the constituents who elected Giffords to office want to give her an opportunity to return and serve, if she can. UPDATE: John S. Wilson is not a hip-hop Republican. Although he is often identified as such, he is actually a Democrat. We regret the error. In other news: Anti-Violence Speaker Charged With Domestic Battery.